This is the time of year when we reassess our values. When we take a hard look at what's important to us and why. Sometimes I freak out because we can't afford to give our kids everything they want or what I think they need. Because sometimes I am certain that my kids need to learn to play every sport and play every musical instrument and if they don't they're screwed. Sometimes I get sucked into the idea that if my kid doesn't have his/her own iPad/iTouch/iPod than they won't make it in this world. But then I come back to reality, usually after a long, reassuring talk with my level-headed husband. I remember the things we are doing right, i.e. teaching our children about good manners, patience and responsibility. I remember the values we believe to be very important, i.e. compassion and freedom of expression. I remember the things I love about our family, i.e. our backyard baseball games, our traditions and our rocking out kitchen dances. Rocking out has always been important to me. I choreographed dance numbers to Chaka Khan's "I Feel For You" and produced sibling dance shows for our enthusiastic audience (my mom and dad). Music, dancing and self-expression was a huge part of my growing up. My house was always filled with music. My parents sang in the car, danced in the kitchen and around the house. It was....amazing. Even when the music stopped for my parents, after their marriage ended, I kept dancing, singing and loving music. Passing on the love of rocking out. Sometimes I think the greatest gift my parents gave me was their love of music and art and life. Now that I have four kids of my own I get it. I get the joy of sharing what you love. Music and dancing is a huge part of our lives. Some mornings, if the kids are looking a little sluggish at the breakfast table I blast a little old-school "Apache" from The Sugarhill Gang and we have an instant breakfast/before-school dance party. We also rock out in the car on the way to school, or on our way anywhere. 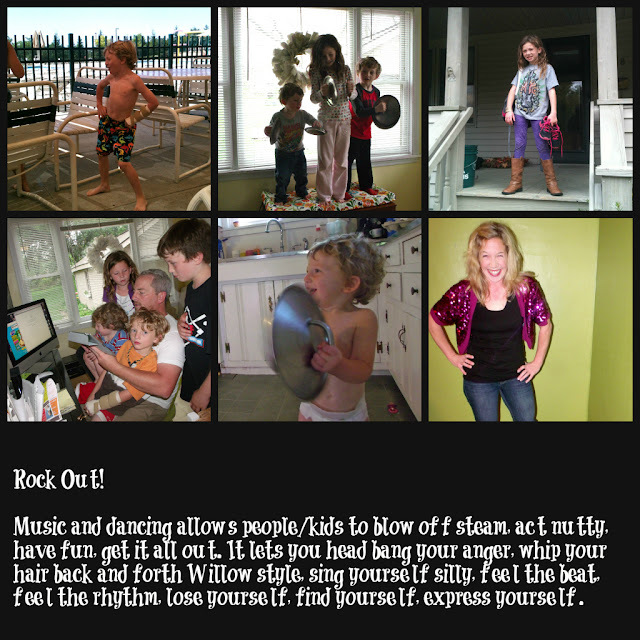 Music and dancing allows people/kids to blow off steam, act nutty, have fun, get it all out. It lets you head bang your anger, whip your hair back and forth Willow style, sing yourself silly, feel the beat, feel the rhythm, lose yourself, find yourself, express yourself. We try to have Saturday Night Kitchen Dance Parties once a month. They consist of mom or dad or oldest brother playing DJ on iTunes and rocking out. Dad gets to show the kids how he wooed me by doing the Worm at the house party where we first met. (Saw that and knew he was a keeper right away). Mom (me) gets to bust a move. The kids get to go a little nuts and have fun rocking out. Rocking out into the future. So yeah, my kids don't have iPads/iTouches/iPods of their own. But they do know every word of "Apache." They also have an appreciation for creative expression. Each child expresses it differently--one child dances everywhere from the kitchen to his flag football game; another child will only bob his head slightly but pays close attention to lyrics and rhythms; yet another child daydreams and creates stories to all the music in our house; and the baby simply soaks up the fun dancing in his underwear. I hope they take their own interpretation of our rock out/dance party fun and carry it with them forever. I hope they embrace who they are and keep on rocking out and expressing themselves. How does your family rock out? Hyundai Santa Fe and Rolling Stone are looking for families who rock. Upload a photo of your family rocking out along with a description of your fam (500 words or less), click here. The prizes are pretty awesome. You could win a photo shoot in Rolling Stone shot by an industry photographer, airfare, hotel and transportation to the 55th Grammy Awards and a fully tricked-out Hyundai Santa Fe custom rock 'n' roller. Yup, that's pretty awesome. It's seriously such an amazing contest and so easy....explain why your family is awesome and how you rock out. Click here to enter. The contest ends December 14, so hurry and enter.